This week, Gartner updated their analysis on the hype cycle of various areas in tech to include gamification. The hype cycle measures new technologies from their first appearance in research, through media hype and criticism, and finally to the plateau of productivity. Where does gamification stand? According to Gartner, it is just finishing its initial rise. 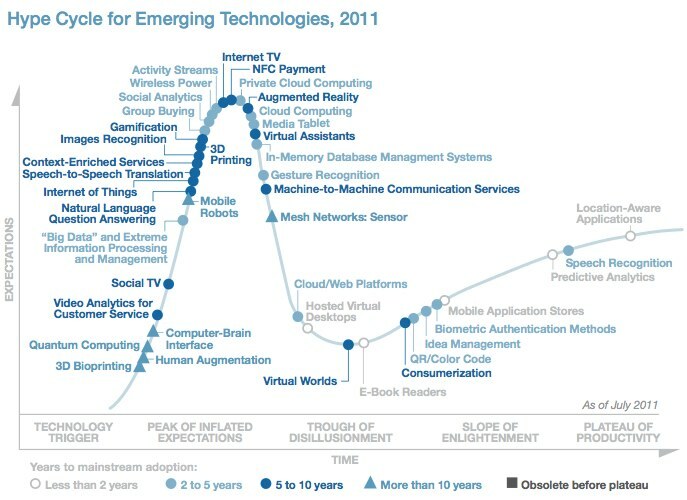 Expectations of the capabilities of gamification are peaking, and it has yet to enter the “trough of disillusionment”. Reality will soon kick in with case studies on successful applications and failures where the tech has overreached. What is most interesting is that “a technology that’s in the trough of disillusionment is still sparsely adopted – less than 5% of the audience has fully adopted a technology while there,” which means growth will continue as projects come online.